Looking for a deal on one of the 2017 Apple iPhone models? Verizon is offering $300 off the iPhone 8, iPhone 8 Plus and the iPhone X. Before we discuss pricing, we want to let you know that a new line is required to get the discount, which means that the deal is open to both new and existing Verizon subscribers. And we should tell you that the deal also requires the trade-in of a handset from a list of acceptable models. 64GB Apple iPhone 8-$16.66 per month for 24 months. 256GB Apple iPhone 8-$22.91 per month for 24 months. 64GB Apple iPhone 8 Plus-$20.83 per month for 24 months. 256GB Apple iPhone 8 Plus-$27.08 per month for 24 months. 64GB Apple iPhone X-$29.16 per month over 24 months. 256GB Apple iPhone X-$35.41 per month over 24 months. How long this deal will last, we have no idea but it is for a limited time only. 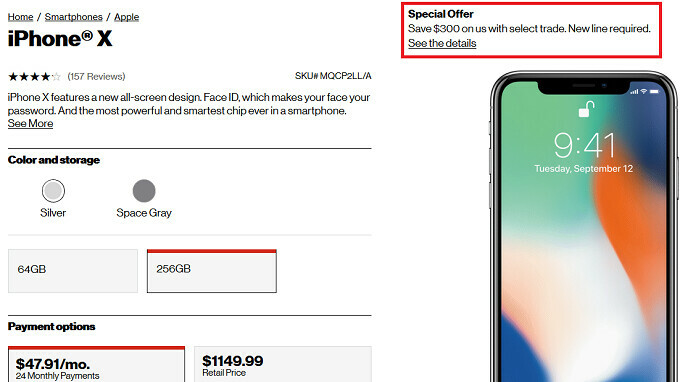 So if you're looking for a great price on one of last year's iPhone models, you might want to take advantage of this deal now.